With their gentle poufs of fabric and tailored appearance, Roman shades offer the perfect hybrid of curtains and blinds. It can be costly to buy these shades to fit your windows though. 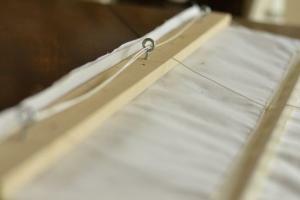 Fortunately, if you have a little sewing experience, you can custom make your own Roman shades at home. Making Roman shades is time-consuming, but the end result is worth the effort. You can use almost any fabric for this project, including cotton duck, upholstery materials, and quilting cottons. Choose a simple neutral fabric for your first window, and then experiment with fun prints and a textures for a different look. Remember that stiffer-bodied fabrics provide a crisper look. Expect to spend about three or four hours creating your custom Roman shade. If you're planning to do several windows, you may be able to speed up the process by making more than one shade at a time. Begin by measuring the inside of your window frame. You'll need to know the width and the length. Write these numbers down. Cut the one-by-two board to the same width as the interior window frame. Cut the dowels to 1/4 inch less than this number. Cut your exterior shade fabric one inch wider than the window width and seven inches longer than the window length. Be extremely careful to make sure the fabric corners are square. Check each corner with a quilting ruler to confirm. Cut the lining fabric to exactly the same dimensions. Confirm that the corners are square. Stack the lining fabric on top of the exterior shade fabric, right sides together. Make sure each edge and corner lines up. Use pins down both long sides. 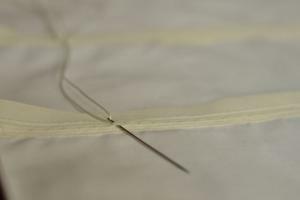 Sew a seam 1/2 inch from the edge on each long side to create a long tube. Turn the tube right side out and carefully press the entire shade. 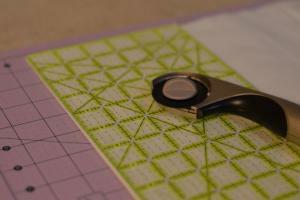 Use the quilting ruler to square up the corners again. 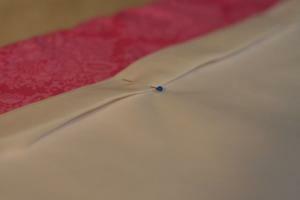 They may have shifted slightly during sewing, and it is essential that the corners are square. 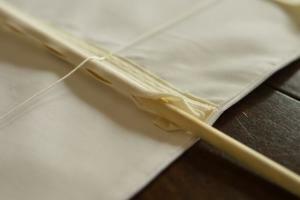 Make a two-inch rolled hem at the bottom edge of the shade. 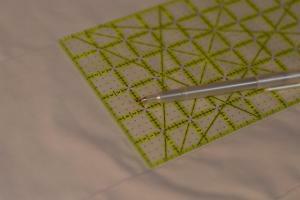 The easiest way to do this is to measure two inches and draw a line with a disappearing fabric marker. 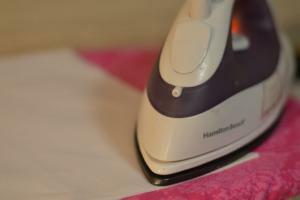 Then use the iron to press the fabric up along this line. Roll the raw edge under and secure with pins. 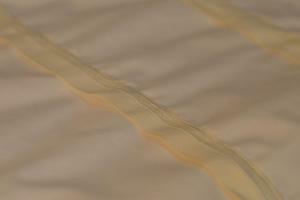 Then top stitch about 1/4 inch from the rolled edge. Lay the shade face-down on your work surface. Measure up from the bottom hem along one long side until you reach the length of the window from step one. Place an "X" in this spot. Repeat with the other long side. Measure up four or five inches from the bottom hem and draw a line all the way across the width of the shade with a disappearing fabric marker. Next, measure six inches up from that line and draw another line all the way across the shade. Continue drawing lines every six inches. As you go, check to make sure your lines are perfectly perpendicular to the edges of the shade. Stop drawing lines when you reach the "X" marks from step nine. Count the number of lines you drew. Gather up this number of dowels. Cut the dowels to 1/2 inch shorter than the width of the window. Cut a piece of Roman shade tube tape to about one inch longer than the window width. Continue cutting strips of tube tape until you have one for each dowel. Fold under the raw edge of the tube tape and line up the top edge of the tape with the first line you drew on the shade. You can use pins to secure it if you wish, but it may be easier simply to adjust the placement as you go. 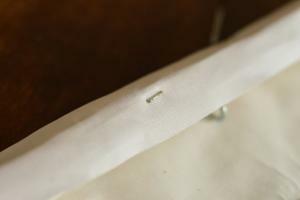 Sew about 1/8 inch from the top edge of the tube tape to secure it to the shade. Repeat with each piece of tube tape. Cut three pieces of cord. The first piece should be twice the length of the window plus the width of the window. The second piece should be twice the length of the window plus half the width. The third piece should be twice the length of the window. Starting at the bottom about three inches from the left edge, pass the longest cord through the loops in the tube tape. Tie it off near the end and use a dab of glue to secure the knot. Then continue passing it through the loops going straight up the back of the shade. It helps to use an upholstery needle to do this. Repeat with the second piece of cord, except place it in the middle of the shade. Repeat with the third piece about three inches from the right side. Slip one end of a dowel through one of the slits and the tube tape and slide it into the tube. Tuck the other end of the dowel into the tube. Repeat with all the dowels. Place the one-by-two board at the top of the shade and mark the locations where the cords come out. Drill the board in these places using a bit slightly smaller than the eye hooks you purchased. Screw the eye hooks into the holes. You may need to use pliers to get them tight enough. Align the board at the top of the shade, using the "X" marks you drew in step 9. The eye hooks should be facing down. Wrap the excess fabric over the top and back of the board and staple in place. String the cords through the eye hooks so that all three cords hang together on the right side of the shade. Install L brackets in your window frame. Install the cleat on the right side of the frame. Use the L brackets to secure the one-by-two board to the top of the window frame interior. Wrap the cords around the cleat to keep the shade up. Making your own Roman shades allows you to personalize your window treatments in a way you never could if you purchased them. 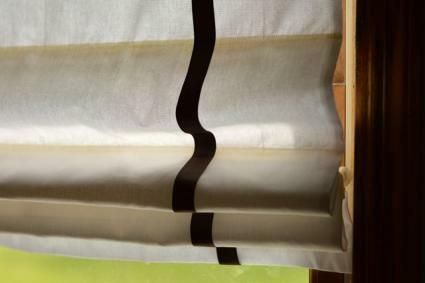 Add ribbon and other trim to give your shades a custom look, or use surprising and exciting fabrics. With a little time and some basic supplies, you can express your personal decorating style.